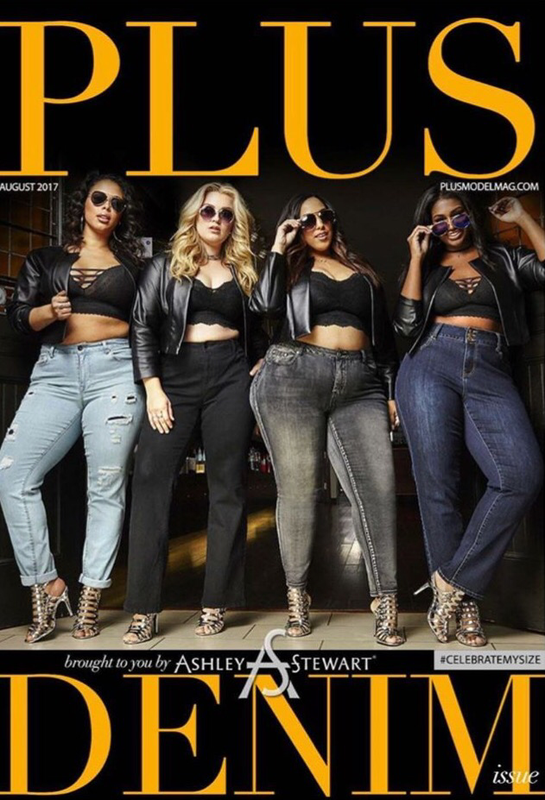 Let’s all take a moment to celebrate brands that use #VisiblyPlusSize models in their campaigns! If you follow me on Instagram, you already know that I had the honor of shooting Ashley Stewart’s latest denim campaign. You also already know that the shots came out amazing!! I love shooting denim because it’s all about showing off those curves and this shoot was no exception. We shot this campaign in May at an adorable salon in Montclair, NJ. This was my second campaign shoot with Ashley Stewart and I really enjoy working with the AS team. When you get booked for a job, you often don’t know which other models you’ll be shooting with, so I was super excited to see I’d be shooting with Halle, Staci, and Tabria. It’s always a compliment to be booked with other talented, working models. One thing that I am always hyper aware of is when I’m the biggest model on set. In this case, with a team of four models, three hair/makeup artists, two stylists, a photographer, a videographer, the creative director, the shoot producer, and a handful of production assistants; I was the biggest person in the room. Years ago when I first started modeling, this would’ve terrified me. It’s not like I wasn’t used to being bigger than most of my peers, but it felt different with modeling. I would internally apologize to the stylist for having to dress me or to the makeup artist for having to contour my chubby cheeks. It’s really wild to look back now and know that I felt that way. I was scared that the brand didn’t realize how big I was or that they didn’t really want to have to work with me. I can recognize now how absurd that mindset is because brands check measurements, digitals, and portfolios before they book you. Today, I feel a lot differently about being the biggest model on set. Today, I am grateful because I know that my presence will help celebrate and normalize women that look like me. My representation will change how women feel about themselves and hopefully, how they feel about others. Today, I can be the biggest person in the room, walk onto a set, and slay every shot without hesitation. If anything, I now worry about being the token big model like I often worry about being the token black model. I look forward to shooting campaigns with models that represent sizes larger than me, because size 18 is the average size of the plus size customer base. Our industry must work to represent the women who wear sizes smaller and larger than this average. And it’s coming! Every time a brand books a visibly plus size model or leaves stretch marks unedited or shows visible belly lines, we get to see more women feel safe in their bodies. 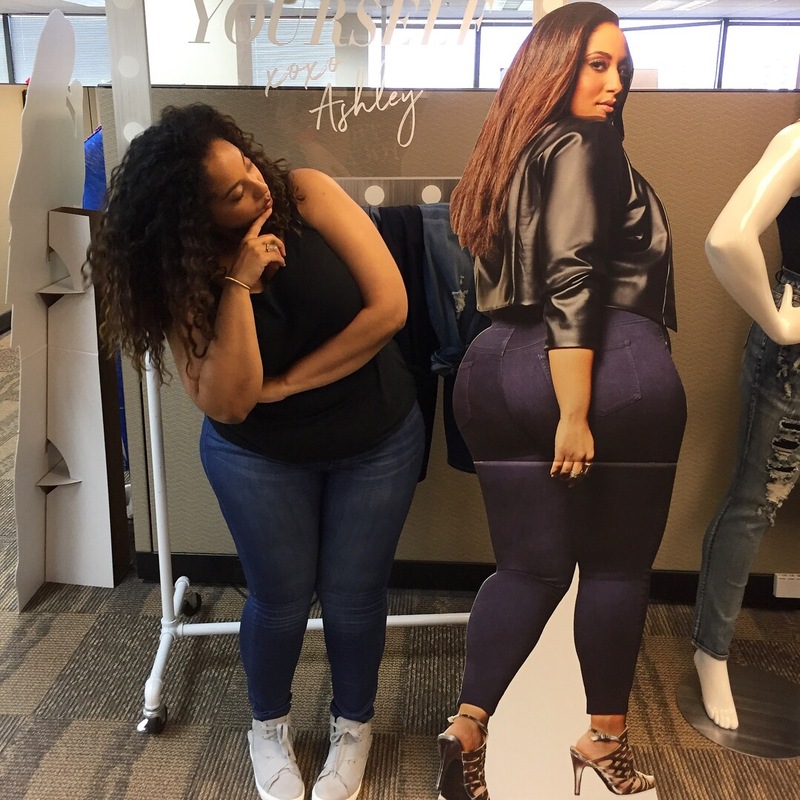 So, I am grateful to be a part of this Ashley Stewart campaign. I hope women can see themselves in it and feel as confident as I did on set that day!